The Wikli is an informal e-flyer containing announcements and messages of interest to Columbia City neighbors. Anyone can contribute, and anyone can edit. This is a brand-new wiki feature, and we welcome any ideas and suggestions. Photo by brainburger. More images in the Citizens' gallery. or to share any other neighborhood news. The Wikli also features selected updates to the Columbia Citizens wiki. To keep it concise, let's limit each new item to around 100 words. Less is more — if you need more, then it's time to create your own new wiki-page on the site and link to it here. Where appropriate, please include your name and any contact info. About once a week, maybe Wednesdays, we'll "freeze" the Wikli's content, move it to its own read-only page, and send an email alert. At first these alerts will go out to neighborhood email lists. Those memberships overlap — so in the interest of spam-reduction, soon it would be good to send the Wikli only to people who opt in. So please opt in. A new neighborhood group held its first meeting Tuesday night, August 28. It was a good crowd hailing from several CC corners (the length of Hudson St seemed to turn out in force). One Citizen gave a thoughtful synopsis of CC's past organizing successes. Others felt CC needs a representative voice to counter top-down City objectives. This Citizen had to leave early, but we'll do our best to get a complete wiki-update soon. Dori Lu, born to Karin Bolstad and Scott Schorn. You might imagine or remember that blissful new-parent delirium, in which the last thing you want to do is cook. Please bring them a meal and meet the baby. Columbia City is baby booming. If you'd like to announce an arrival and help any harried new parents out there, feel free to organize some wiki-relief. Take a look at the community calendar. Farmers' market, Sunday brunch, and any other neighbor events you'd like to post. Have you seen this cat? Her name is Chossu, and Vesteinn and Aaliyah would very much like to have her back with them. 722-2503. Any other lost or found treasures? Post them here. 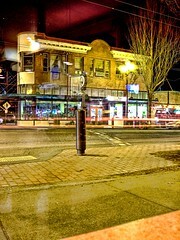 Columbia City: burgeoning blogopolis. In the course of just one week we got two brand new neighborhood blogs, already chock-full of local insight. Check out Captain Columbia City (not a caped crusader — think salty seafarer instead) and Columbia Citizen (hmm… sounds kinda familiar). With so many upstarts, it's enough to make Columbia Citizens (est. 07/07/07) feel positively established. The Columbia City Gallery is hosting Rainier Valley Narrative, Portraits and Stories from the Rainier Valley. Joanne Petrina's exhibit shows at the gallery through September 16, then it moves to City Hall. See the slideshow: the accompanying stories are remarkable testaments. Wild parrots of Columbia Heights. If you haven't seen them on summer afternoons, you've probably heard them. They're the CC conures. Like many of us, they're colorful transplants. Last week's Rainier Valley Heritage Parade: coverage and photos in the BHN/SDJ. Fire update. After last week's apartment fire on the SE corner of 39th & Hudson, it seemed some neighborhood wiki-organizing might be in order to help replace clothes and furniture. For now, the two displaced families have chosen to hold off on participating in that kind of outreach. Neighbors' websites are beginning to appear on the wiki. Take a look at our sampling of local creativity. Added a referrals page for tax accountants. If you've had a positive taxing experience (? ), share it there. This Wikli's content is now fixed, but anyone can post to the next one here.